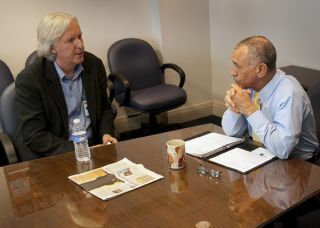 NASA Administrator Charles Bolden, right, and award-winning writer-director James Cameron, meet at NASA Headquarters in Washington, D.C. on Jan. 19, 2010. It was space science meets science fiction. Writer-director James Cameron, following therelease of his much-heralded "Avatar" movie, met with NASAAdministrator Charles Bolden at NASA Headquarters in Washington, D.C. onJanuary 19. The pair discussed science education, and howto engage the public in scientific exploration, among other subjects. Cameron, who formerly served on the NASAAdvisory Council, has had a life-long interest in space and science, asevidenced by several of his other films. "Aliens" concerned spacetravel and extraterrestrial life forms. "The Abyss" dealt withunderwater military and industrial operations, while two Terminator moviesfeatured futuristic lethal cyborgs. All of these films represented huge boxoffice successes, and could very well inspire the next generations of spacescientists and engineers.